I drew these a few weeks ago, but forgot to scan and upload them. Please refer to my earlier entries on Bible Wines and Hymnals respectively. FWIW, I’ve done the lexical studies involved in the context of Judaic use of wine, and let’s just say it would be difficult to convince me at this point to join the ranks of the prohibitionists. If you’re a Good Samaritan who finds a man on the side of the road, beaten because he fell among thieves, pouring Grape Juice on his wounds would have zero effect. Okay, it would stain the bandages. Grape Juice doesn’t burst old wineskins; it doesn’t expand. That analogy to both the Kingdom of God and the Christian life are powerful because they should expand from grace to grace. He stuff appears regularly in Credenda/Agenda magazine. Oh, man. I certainly hope that doodle doesn’t come from your time with us at FBC. 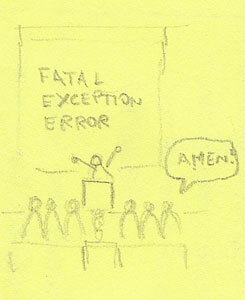 I detect a luddite in the front row to the right ‘amen’ing the BSOD. 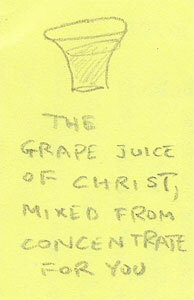 On the subject of grape juice: I think it was wine in Jesus’ cup. No doubt. Paul accused the corinthians of getting drunk at the Lord’s table… it was definitely wine.